A new, lip color innovation combines a lip stain with an ultra glossy finish. 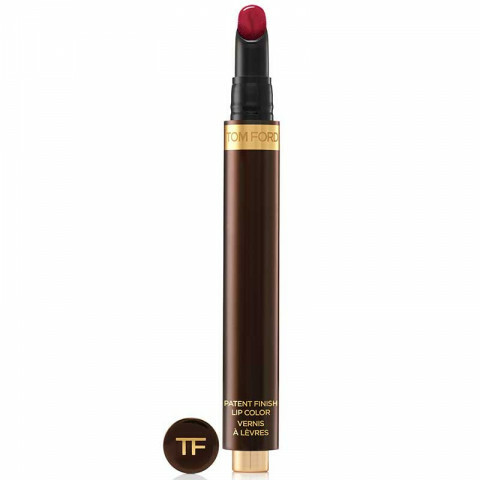 Presented in a unique, easy-to-use click-pen with plush, sponge-tip applicator, patent finish lip color delivers intense, vibrant color with longlasting high-shine. With lightweight texture and flexible, comfortable wear, stay-true color gleams in eight decadent shades from the bright cherry of no vacancy to the blackened berry of orchid fatale. This product is great! I went to reapply after a couple cups of coffee and it still looked great! Love the color and wear! I carry at least 10 lip products (total lip junkie) with me on a daily basis and this is quickly become my go to! These are sooo shiny on the lips and the colors are very beautiful and vibrant. Love these lippies from tom ford! Applicator makes it easy to apply color all over the lips. Exposed is a gorgeous shade. These are extremely shiny, pigmented and vibrant!! They remind me of the Chanel Stylos. Love! Lovely stain that feels great on my lips. Lasts through the day without wearing off. This is by far my favorite product in the cosmetics catagorie . It stays super well and super vibrant ! I will be buying tube after tube of this !